My poor hips are fried. While figuring out how to repair or replace them I'll be taking shorter and easier rides. 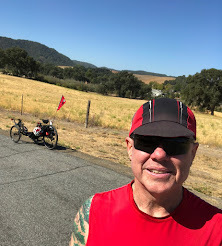 This morning's ride was back to the duck pond with a thermos of tea Easy 10 miler with just a touch over 800 feet of gain. My hips may be fried (one a little more then the other) and while hiking and assorted other activities are on hold I can still ride in comfort laid back on three wheels. 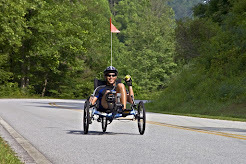 You gotta love recumbent cycling, so easy on the body and yet so good for it. 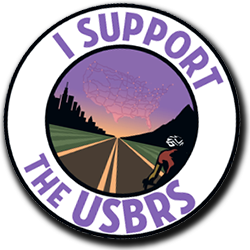 How sad it is that people can't break away from the herd and explore the world of recumbent cycling. Right now my trike is the only thing that's keeping me active and in good shape mentally and physically. As long as I take it easy and pop some ibuprofen it looks like I'll be riding my "most excellent" trikes right up until the day my hips are sliced and diced and riding soon thereafter. Tea time at the duck pond. Starting to warm up, headed home via my favorite shortcut.